The Southern Regional Council of Confederation of Indian Industry (CII) organized an exclusive Interactive Session with the Chief Minister of Tamil Nadu, Mr. Edappadi K. Palaniswami. Mr. M.C. Sampath, Minister for Industries, Mr. P. Thangamani, Minister for Electricity, Government of Tamil Nadu, and other senior Government officials also participated in the session along with leading industrialists from 6 Southern States. 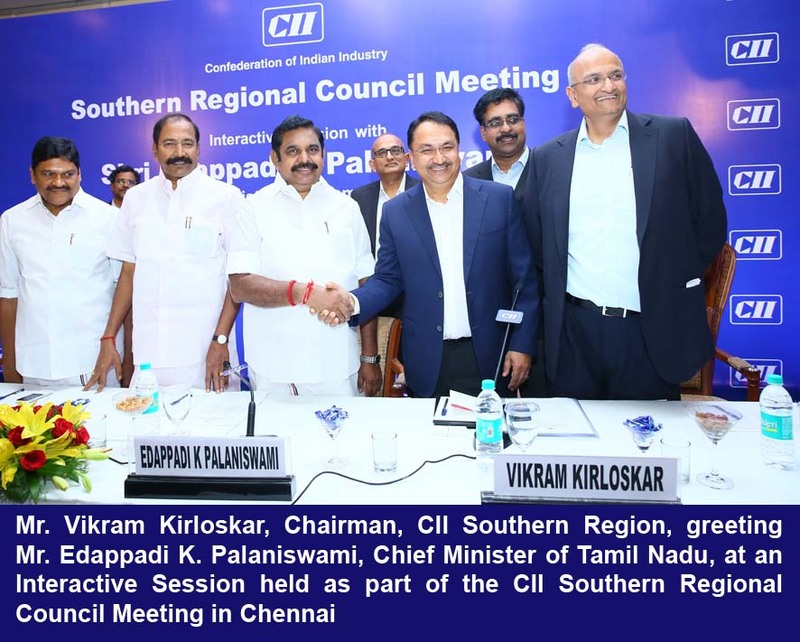 While addressing members of the CII Southern Regional Council, Mr. Edappadi K. Palaniswami said that the State Government has been taking several policy measures to make Tamil Nadu a leader in economic development. Towards this, the State will promote industrial corridors and would come out with an Aerospace and Defence Policy to give a boost to the manufacturing sector. He appreciated the efforts of CII in successfully organizing the Global Investors’ Meet 2015. He emphasized the importance of ICT sector in TN and said that the Government has been supporting in organizing CII Connect, a flagship initiative in the ICT sector. He highlighted the strengths of Tamil Nadu as an investment destination in the Manufacturing, Infrastructure and Services Sectors. Tamil Nadu is well equipped in meeting the dynamic global demands which makes the State a leader in various aspects, he said. To improve the EoDB ranking of the State, Tamil Nadu Government has taken measures to launch an effective online Single Window Clearance System. The upcoming Aerospace Park in Kanchipuram District and development of Aerospace Policy will ensure a bright future of the State. He welcomed industries to establish their businesses in the Tier-II and Tier-III cities and stated that the Madurai – Tuticorin Industrial Corridor is being developed. The proposal of the State Government to bring out an exclusive Aerospace and Defence Policy will give a boost to the Manufacturing Sector in Tamil Nadu, added the Chief Minister. Mr. M.C. Sampath invited industries to establish their businesses in Tamil Nadu. He reassured strengthening the Ease of Doing Business through the help of Guidance Bureau. He mentioned that Rs. 1,295 crores have been allotted for establishing a multi-modal transportation hub in the State. Mr. Vikram Kirloskar, Chairman, CII Southern Region, in his welcome remarks, thanked the Chief Minister for participating in the CII Southern Regional Council meeting. He also appreciated the Tamil Nadu Government for its path-breaking measures taken towards the economic development of the State. Mr. R. Dinesh, Deputy Chairman, CII Southern Region, and Mr. P. Ravichandran, Chairman, CII Tamil Nadu State Council, also addressed at the session which was attended by more than 100 leading industrialists/CEOs from all over South India.